If You Have Ever Been Stressed Out Because You Can’t Be In Two Places at Once, If You Simply Just Don’t Want to do Something, Call Me at 706-899-8121. If You Ever Need a Helping Hand, Or Simply Wished You Had an Assistant Now and Then , Call Me at 706-889-8121. If You Have a First , Second, Third Home or Are Renting a Cabin in the area, and have Wished that When You Arrive You Had Everything Looked After and Stocked Before You Arrive so You Don’t Have to Waste Part of Your Vacation, Call Me at 706-889-8121. If You Want Someone to Watch Your Property, Schedule Maintenance, and Be There to Watch Hired Help, Call Me at 706-889-8121. 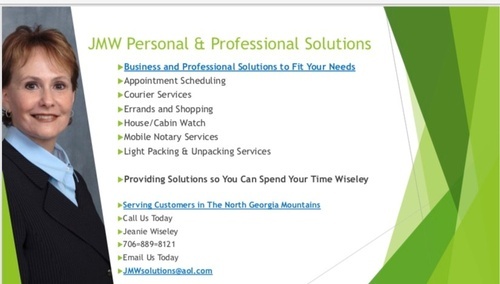 Thank You In Advance for Considering JMW Personal & Professional Solutions ! We Truly Appreciate Your Business and Want To Improve Your Life so that You are Spending Your Time Wiseley . My husband and I fell in love with this area while vacationing in a Mountain Cabin several years ago. In November 2018, we purchased our Cabin home in Ellijay, Georgia and are Full time Residents. My family spent many Fond years vacationing in the Great Smokey Mountains in a cabin that my parents purchased as a second home .